The price of copper, Australia’s fifth-largest mineral export, is set for a reasonably bright future if Chinese demand holds up, according to analysts. A base metal used mainly in electrical wiring, roofing and plumbing and industrial machinery, copper is currently trading at $US6780 per tonne, or $US3.11 per pound. It has been drifting lower for the past four years, having peaked at $US10,160 in February 2011. Strong supply, however, would be a headwind against price growth, said UBS commodities analyst Daniel Morgan. 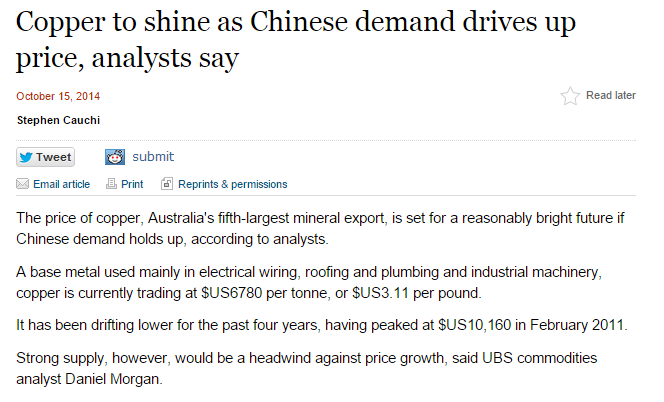 While the rising price of copper benefits Australia’s mining and refining industries–as well as copper scrap metal merchants who recycle and sell the item in bulk–a sudden increase in prices due to the upsurge of demand in China would be detrimental for other Australian industries that rely on it. For example, in the electronics industry, a sudden rise in copper would mean difficulty in acquiring the materials required for equipment production, which could irreversibly hurt that industry. To avoid such issues, it is ideal that prices remain stable or are only allowed to rise in a controlled manner. To this end, government could introduce the necessary controls to curb a sudden rise in prices. This is undesirable, however, since it could weaken investor confidence. Instead, it is more preferable that the price of a commodity be controlled by the relevant production industries. While mines, in this case, play the biggest role in controlling the rise of copper prices by increasing production (and thus, supply) of the copper products that China needs, copper scrap metal buyers like Global Resources International Pty. Ltd. can also help augment supplies and delay the rise of prices. Since the conversion of used refined copper to metal fit for production purposes takes a lot less time and energy than refining material directly from ores, reusing is a much more efficient means of boosting existing supplies. The cheaper price of recycled copper can also act as a counterbalance to rising prices, as well as provide a viable option for cost-conscious industry players.